The Pigeon Pages NYC reading series nests monthly in Brooklyn, NYC. We showcase a dynamic and diverse group of writers for a literary evening each month, and are proud to be a platform for emerging writers while also celebrating the successes of local authors. Our readings are always free & open to the public, hosted by Alisson Wood. McNally Jackson in Williamsburg is located at 76 North 4th St, Brooklyn, NYC, right off the Bedford Ave. L stop. Pallavi Wakharkar was born and raised in Phoenix, AZ. She currently lives, works, and writes in Brooklyn, NY. Find her on Twitter at @p4llavi. Spencer Williams is an MFA candidate in poetry at Rutgers University-Newark. She is the author of the chapbook Alien Pink (The Atlas Review Chapbook Series, 2017) and her work has been featured in or is forthcoming from [PANK], Powder Keg, Bat City Review, and ANMLY. Her film work has screened at the Milwaukee LGBT Film Festival and at Fotofocus Biennial.You can find her tweeting mostly nonsense @burritotheif. Books will be available for purchase and authors will be available to sign books following the reading. Learn more about McNally Jackson Books on their website, here: www.mcnallyjackson.com. Chloe Caldwell reading at PowerHouse Arena on August 27th, 2017, photographed by Lindsay Comstock. Since 2016, we've hosted writers including Melissa Febos, sam sax, Rob Spillman, Sarah Gerard, Nick Flynn, Paul Lisicky, Rakesh Satyal, Kaitlyn Greenidge, Darin Strauss, Garrard Conley, Annie DeWitt, Leigh Stein, Lynn Steger Strong, Ariana Reines, Lauren Hilger, Sophie McManus, D. Foy, Kaitlin Solimine, Chloe Caldwell, Corey Mead, Elizabeth Gaffney, Said Sayrafiezadeh, Natalie Eilbert, Matthew Lansburgh, Susan Choi, Helen Phillips, and Tobias Carroll. Our annual NYC Lit Mags Readings & Celebrations have showcased Tin House, No Tokens, A Public Space, FENCE, and Joyland. Our September 2017 readers: Jodi M. Savage, Nick Flynn, Alisson Wood, Paul Lisicky, & Hannah Beresford. From L to R, Lisa Marie Basile, Diannelly Antigua, Alisson Wood, Adam Dalva, & Darin Strauss. April 30th, 2017. From L to R:: Lindsay Comstock, Alisson Wood, Jennifer Baker, Chloe Caldwell, Katie Heaney, & Molly Tolsky, at PowerHouse Arena on May 21st, 2017. Tobias Carroll at PowerHouse Arena, on May 21st, 2017. Photographed by Jamal Carryl. 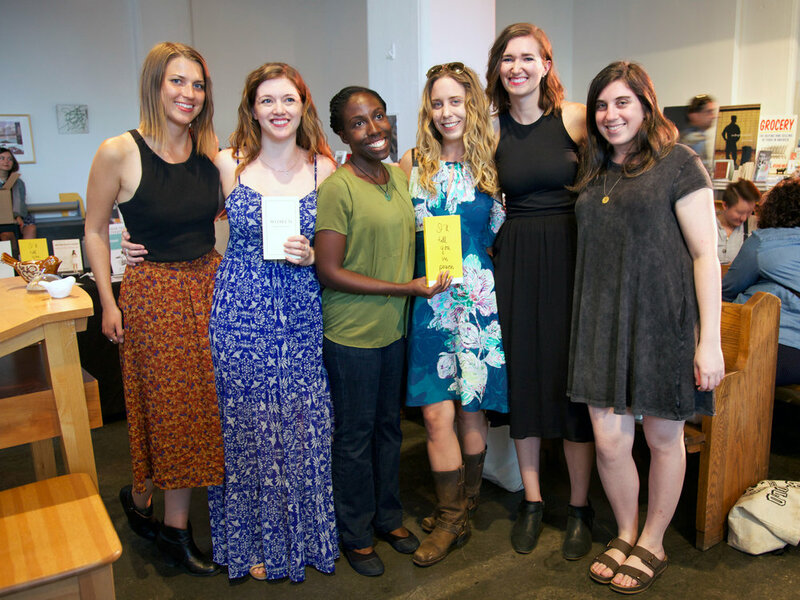 The Pigeon Pages reading series was founded by Alisson Wood in 2016 at BookCourt bookstore in Cobble Hill (RIP). In 2017, the series found a new home at PowerHouse Arena bookstore in Dumbo. We talked at length about our love of pigeons over at English Kills Review. The 1st Annual Best of NYC Lit Mags celebration, featuring Slice, No Tokens, Fence, A Public Space, & Joyland. Interested in reading with us? Email us at pigeonpagesnyc [at] gmail.com.